Things that matter in life! Moved by the event today when I got the news about Steve Jobs death, I realise how intriguing his masterpiece Apple and the ecology around this is. Condolances to Steve’s family, a great loss for You and all of us. Excellence in all the things you do in life, since you only got one. Have been inprinted by Steve’s notion. My first encounter with Apple devices goes way back into the mid 80’s when I started my education at the University and learned to master Apple II and Apple Lisa. Loading the operating system on floppy disks, and using the mouse. 1987 I bought my very first computer Macintosh SE/30 for a huge pile of money (36500SEK) given that I still were a student. This piece of art, still works fine, and live a second life at our summer residence re-painted (when I gave it away to my younger sister) with bright blue-metalic paint 😉 In late 80’s this was a very fast computer, with 4mb ram and 40gb HD?! I still have all the software intact, it is a closed system but it runs without any errors…. Why one might ask? It simply works…as for my first Macintosh SE/30 24yrs later? none of my PCs run that long…. I have a dual personality to the Apple brand. First I do like the appearance, the way things work, design and all, but I have great doubts about the walled-garden approach. Since I do practice, and preach in my lectures about open-innovation, open leadership, open business models and do like open-source… it really do not match the way Apple is run at all? How comes? Being human and irrational! One can have several personas I reckon! Today all media, and the web have been flooded by messages about Steve Jobs and his genius. I can only summon the hymn to him. But as the dark side of the moon, he also had a bit strange ways of working, the extreme control pattern. Empathic is not a word I have found yet when Googling his name? Innovative yes! Things that matter in life is related to love, to your family and friends, close circles, to what you do professionally and by sheer interest of creating and sharing your insights and know-how of things to do greater good. 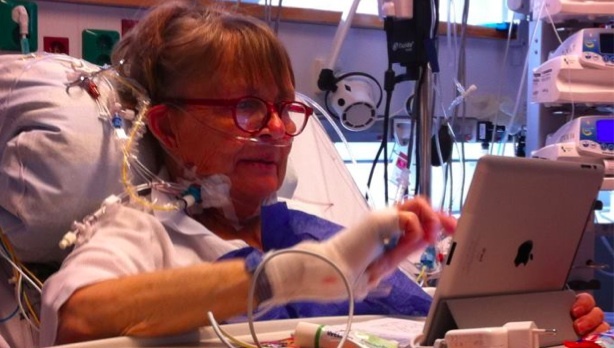 My beloved mother recently got her first iPad2 and it has become emboddied with her, given her hospitalisation. It makes her connected to life outside the walls, medicines and treatments. This connected environment improves her wellbeing. I hope that the good things from the corporate culture within Apple will continue to bring us with marvellous devices. Having Steve’s spirit engraved into the walls. This entry was posted on Thursday, October 6th, 2011 at 9:42 pm and is filed under Uncategorized. You can follow any responses to this entry through the RSS 2.0 feed. You can leave a response, or trackback from your own site.